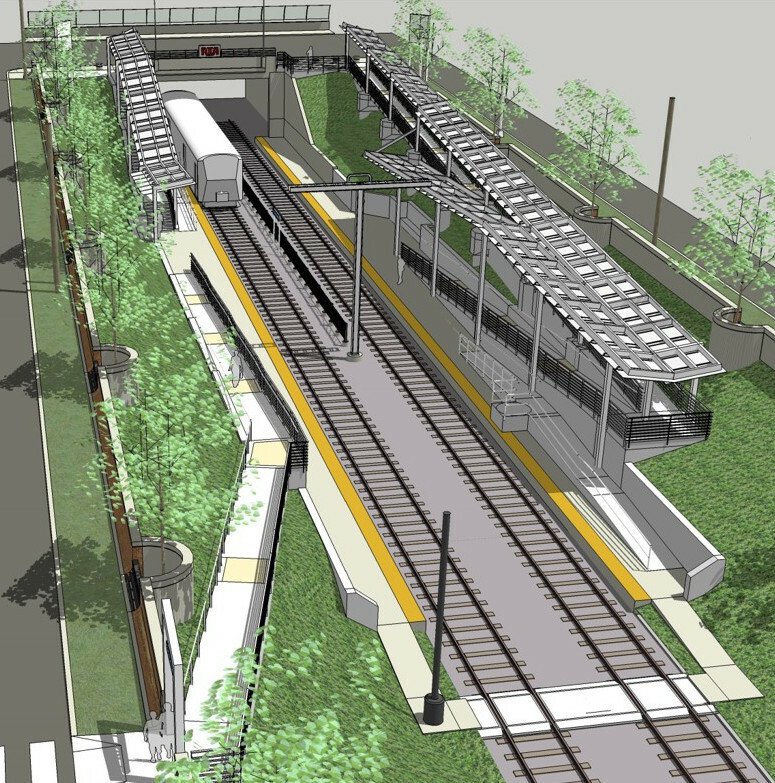 CLEVELAND -- RTA is planning to rebuild the East 116th-St. Luke's light-rail station, 2780 East 116th St. at Shaker Boulevard, just west of Shaker Square. The station is used by Blue and Green line trains. March 4, 2010 -- Held final public meeting, Planning complete. March 18, 2014 -- Board awarded design contract to City Architecture for $489,000. Eight Disadvantaged Business Enterprise (DBE) firms will share 20 percent of the project. Jan. 9, 2018 -- Staff presented an update to the Board. Will be renamed the East 116th-St. Luke's Station when construction is complete. Will have a secondary entrance that connects to muse walkway through the Saint Luke's Development and the Intergenerational School. It was funded through an initiative led by the Cleveland Neighborhood Progress and funded by the Saint Luke's Foundation. Features public art by Beatrice Coron, funded partially by a grant to Land Studio. The station needs to be replaced. It is important to RTA and to the Buckeye neighborhood it serves. In 2010, RTA, in collaboration with the Buckeye-Shaker Square Development Corporation, completed a station-area development plan. This plan brought together the community, stakeholders, and residents with RTA to develop a station that best met their needs. The plan was funded through a NOACA Transportation for Livable Communities Initiatives (TLCI) grant, with support from the Cleveland Foundation. The plan, adopted by the City of Cleveland Planning Commission, calls for public art, lighting and a bright, open welcoming station. The nearby recent developments of St. Luke's, the Rice Branch of the Cleveland Public Library, and Harvey Rice Elementary School, Intergenerational School and Saint Luke's Development make the station even more vital to the fabric of the community. Note: The preferred style of the organization is Saint (written out) and Luke's (with an 's). The station opened April 11, 1920, when service began from Shaker Square to East 34th Street and downtown. In 1980 and 1981, the trunk line of the Green and Blue Lines from East 55th Street to Shaker Square was completely renovated with new track, ballast, poles and wiring. New stations were built along the line. At this station, new platforms and retaining walls were installed, and wooden stairways were replaced by the present covered concrete stairways. The renovated station opened Oct. 30, 1981. From 1927-1999, the station served the nearby St. Luke's Hospital.